The list of superlatives for the legendary Hall of Famer Oscar Robertson is synonymous to an infinite-like novel. Along with Russell, Jordan, Chamberlain, Abdul-Jabbar, Magic Johnson, Bryant and Lebron James, he stands tall as one of the greatest players in NBA history. His lifetime statistics alone solidify his irrefutable iconic standing withy the "Big O" averaging an unfathomable 25.7 points, 9.5 assists and 7.5 rebounds per game! For 14 seasons with the Cincinnati Royals and Milwaukee Bucks he dominated the hardwood floor virtually better than any of his peers, dubbed the "king of the triple double" whereby he resides as the only basketball player to ever miraculously average a "triple double" for an entire season! The 12-time all star point guard won his only MVP award in 1964, claimed 6 NBA assist titles and won an NBA championship in 1971 with the Milwaukee Bucks. 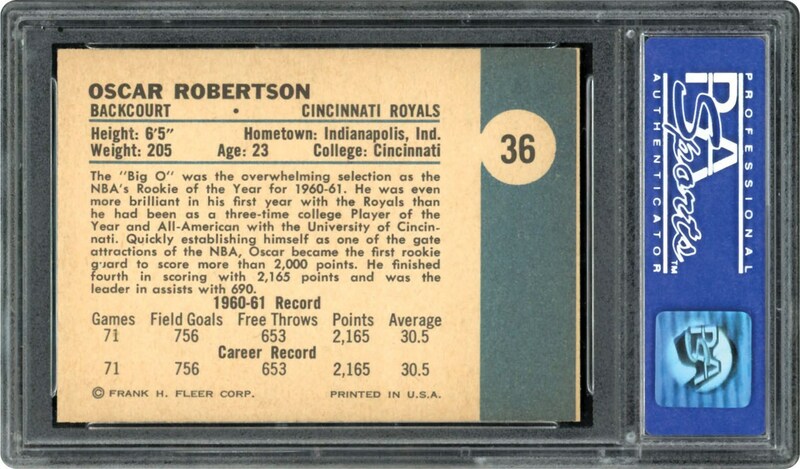 Like so many other immortal sports stars, his most coveted cardboard keepsake is his rookie card, with this breathtaking 1961 Fleer PSA NM/MT 8 offering Robertson's undisputed inaugural issue. The card itself portrays virtually all of the technical attributes and eye appeal of any "Pack-Fresh" example. 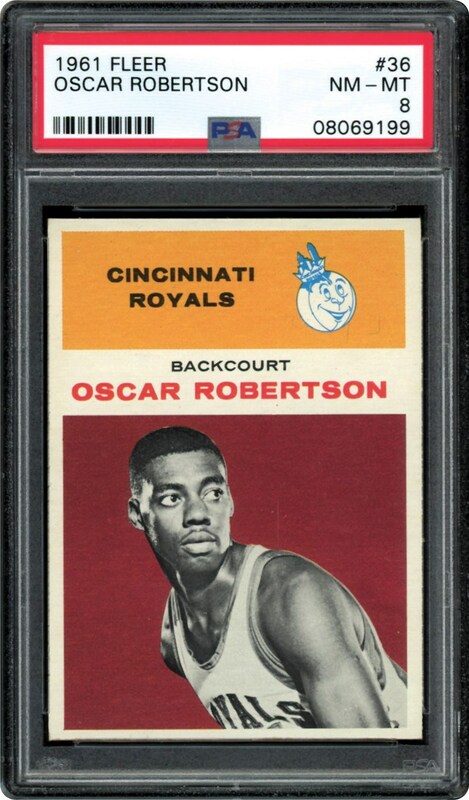 The seemingly immaculate Oscar Robertson image is ably assisted by sparkling orange/maroon red hues, with the classic illustration exhibiting near-perfect centering between four blinding white borders. Razor sharp corner tips and near-immaculate surfaces complete this amazing Robertson rookie card that exhibits many of the awe-inspiring aesthetics consistent with any pristine subject!